During the official welcoming ceremony, the national anthems of Cyprus and Israel were performed and a military guard presented honors. The ceremony took place in the presence of leaders of religious groups based in Jerusalem, including the Patriarch Theophilos III of Jerusalem. 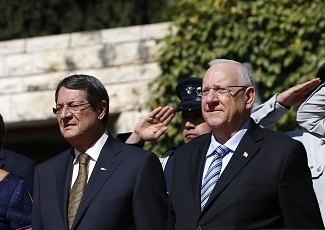 After the ceremony, in his welcoming remarks, Rivlin said: “The relations between Israel and Cyprus between our governments, between our two peoples are long-standing”. Anastasiades said in recent years there had been an unprecedented growth in all aspects of bilateral relations; political, economic, (including cooperation on energy) and in the area of people to people contacts and cultural exchanges.